When word of the discovery leaked, nothing could stop the masses of prospectors looking to get rich quick, despite the treaty protections that awarded that land to the Sioux. Sitting Bull and Crazy Horse, the local Indian leaders, decided to take up arms to defend their dwindling land supply. Custer was perhaps the most flamboyant and brash officer in the United States Army. He was confident that his technologically superior troops could contain the Native American fighters. Armed with new weapons of destruction such as the rapid-firing Gatling gun, Custer and his soldiers felt that it was only a matter of time before the Indians would surrender and submit to life on a smaller reservation. Custer hoped to make that happen sooner rather than later. His orders were to locate the Sioux encampment in the Big Horn Mountains of Montana and trap them until reinforcements arrived. 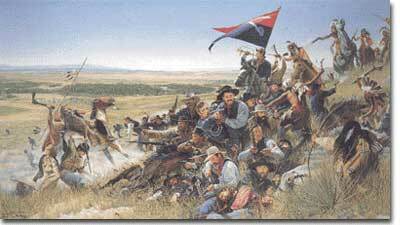 But the prideful Custer sought to engage the Sioux on his own. On June 25, 1876, he discovered a small Indian village on the banks of the Little Big Horn River. Custer confidently ordered his troops to attack, not realizing that he was confronting the main Sioux and Cheyenne encampment. About three thousand Sioux warriors led by Crazy Horse descended upon Custer's regiment, and within hours the entire Seventh Cavalry and General Custer were massacred. The victory was brief for the warring Sioux. The rest of the United States regulars arrived and chased the Sioux for the next several months. By October, much of the resistance had ended. 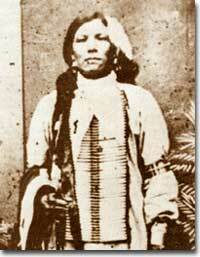 Crazy Horse had surrendered, but Sitting Bull and a small band of warriors escaped to Canada. Eventually they returned to the United States and surrendered because of hunger. Is this really Crazy Horse? According to most historians, the great Sioux warrior never allowed his picture to be taken. While no images of Crazy Horse have been universally proved as the real deal, this tin-type has been claimed authentic by the Oglala Sioux Tribal Council. Critics of United States policy also made their opinions known. The most vocal detractor, Helen Hunt Jackson, published A Century of Dishonor in 1881. This blistering assault on United States Indian policy chronicled injustices toward Native Americans over the past hundred years. The American masses, however, were unsympathetic or indifferent. A systematic plan to end all native resistance was approved, and the Indians of the West would not see another victory like the Little Big Horn. A very attractive and informative site on Battle of Little Big Horn history and the ongoing archaeological study underway on the battlefield. 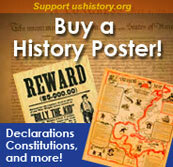 Easy to naviagate to find maps, photos, biographies and a timeline of events. 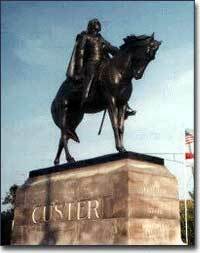 Here is a concise biography of the General Custer from "Ohio History Central," Custer was born in New Rumley, Ohio. George Herenden was a civilian hired to scout for the Seventh Cavalry, under Major Reno. This webpage provides his eyewitness account of the Battle of Little Big Horn, as told to a New York Times reporter. The illustrated, present-day overview of the battle and background information is good reading, too. This article printed in Harper's Magazine, August 5, 1876, editorializes on the need for a new policy regarding the Indians in the wake of the Battle of Little Big Horn. Reno took a steady gallop down the creek bottom three miles where it emptied into the Little Horn, and found a natural ford across the Little Horn River. He started to cross, when the scouts came back and called out to him to hold on, that the Sioux were coming in large numbers to meet him. -George Herendon, describing the moments before the carnage began at Little Big Horn. Did you always wonder about the family legend that your great-grandfather was killed fighting with Custer? Now you can find out yourself on this list of military (and some civilian) casualites of the Battle of Little Big Horn.